"New York-based Antibalas was formed in 1998 by musicians from King Changó, the Soul Providers, and the Daktaris. Influenced by Nigerian Afro-beat, American soul, and Latin dance grooves, Antibalas started playing at clubs around New York, hosting a weekend party called Africalia, giving them the opportunity to perform their particular style based on a combination of different cultures immersed in the band. After recording Liberation Afrobeat, the live album Live in New York! Summer 1999 was released. 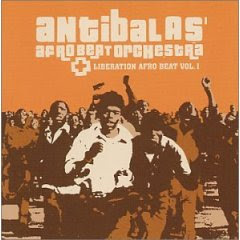 Liberation Afro Beat, Vol. 1 was issued in early 2001. The group returned to recording in 2004 and issued Who Is This America? on the Rope-a-Dope label, followed by Security on Anti Records in 2007."